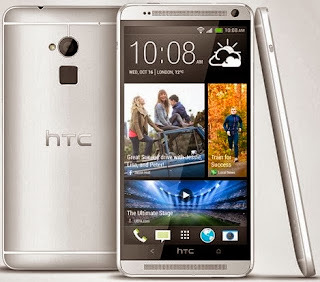 HTC has officially announced the HTC One Max smartphone, a 5.9 inch smartphone that almost looks all screen on front. Featured with fingerprint sensor (much like the iPhone 5S) to enhance security, usability with the help of HTC sense 5.5, full HD display (1080p) and vivid colors for perfect entertainment. Also featured with camera ultrapixel technology, HTC One Max will laugh 16MP camera, bringing real life pictures as if looking the same thing both real life and on phone screen. The front camera also has 2.1MP, and a full HD front camera recording, so its never a problem taking pictures alone or with someone. Carry HTC One Max like a home theater, the HTC BoomSound is loud enough for surround play, thanks to dual front speakers, plus the 5.9-inch full HD display. The fingerprint sensor is found at the back of HTC One Max, used for security purposes. Scan to unlock the phone, or assign a specific apps (max 3) using different fingers. Available this mid-October 2013, probably on USA first, then on key markets in Asia and Europe. HTC has not yet disclosed the price of HTC One Max.